It's the last few days of my holiday and whilst I savor every last bit of home cooked food, every last moment spent with my dear parents, every relaxing picnic at the beach and cherish every last memory, I have invited the wonderful Joy of Joylicious to share part of HER childhood, her heritage and her memories here with you today. Not only does Joy have superb and original photography on her blog, she interweaves it with wonderful stories of her past, her family and her future aspirations. Joy, it is a pleasure to have you here today. different parts of the World with the same loves, passions and excitement for life and wonder for food. where I often follow her stories of her family, especially adorable little Maryam through her captivating images of food, love and life. Thank you for inviting me to your wonderful space today dear Sukaina. me, finding life and glory through all things living. notion to achieve pure relaxation? Japanese soba noodles. I often buy my eggs through a local organic egg-farmer and with the abundance of cucumbers coming from our garden I figure I’d celebrate the beauty of Summer and perhaps even a little relief from the heat. red chile flakes and set aside. towel-lined platter to drain. Transfer noodles to large bowl. Add dressing and toss to coat. Wonderful post Joy. Your pictures are gorgeous, original and creative. Thanks for posting this Sukaina. Beautiful pictures! The combination sounds delicious. Wowow beautiful presentation, Joy! Love the nest look. You're making me soooo hungry now =). Nice to know you Joy. lovely pictures! OH wow! Beautiful! Looks great for summer! What a wonderful guest post with gorgeous photos! Sukania, enjoy the rest of your vacation! This is a lovely dish and so beautifully illustrated. Gorgeous, gorgeous, and so perfect for summer. Thank you for introducing us to Joy!! Wonderful photos! 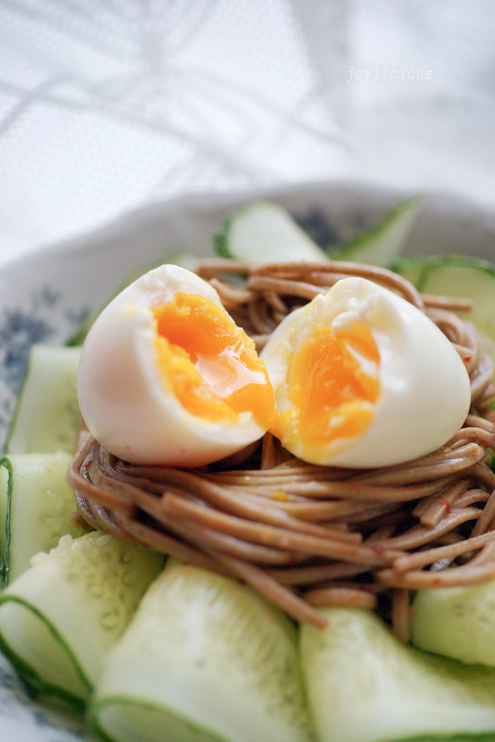 The little bird's nest is way too cute but my favorite photo is the one with the fork. Love. Joy is such a talent, it's wonderful to see her here. 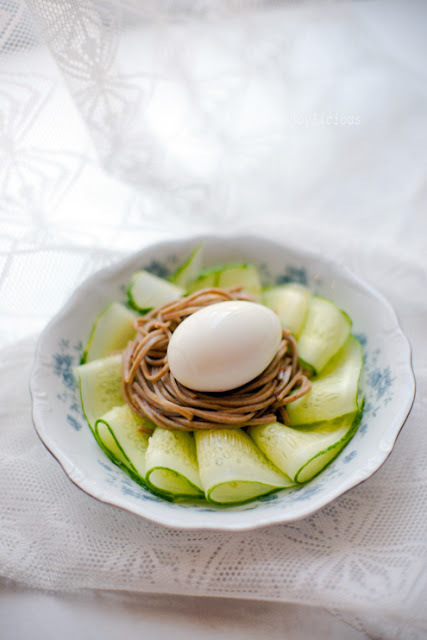 I adore simple soba noodle salads like this, I could slurp-up a whole plateful. Joy, the photography is truly stunning, and agree with Yasmin, especially the one with the fork! 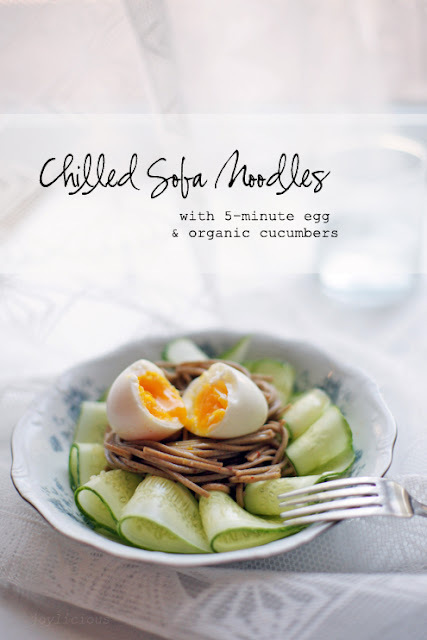 I <3 Soba Noodles, love this recipe. This was indeed a delightful post with great photography! Lovely Joy and Sukaina! 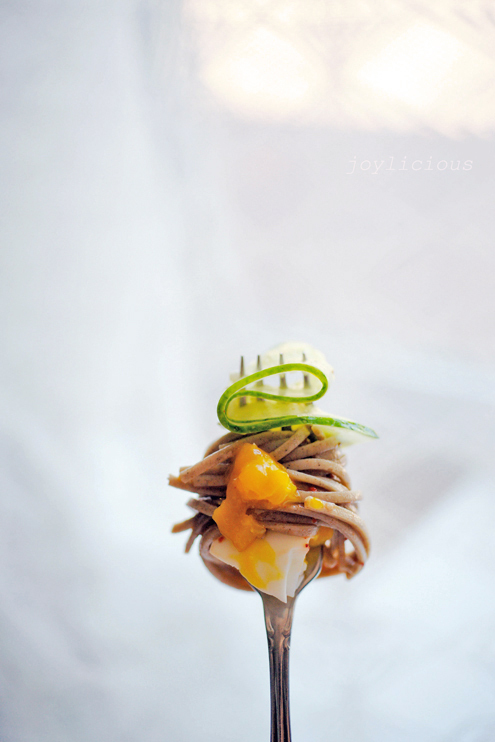 This is such a beautiful bowl of noodles- I love the shot with yolk oozing out :) Joy's work is a delight to look at..Lovely post both of you! Hi Joy this looks amazing, how do you make such simple ingredients and ideas look so amazing - a real talent. And what a great balanced meal the noodles make, all in one bowl. Sukaina your blog is as beautiful as ever, enjoy your last few moments at home. Now I would like to also add that since Valentine's Day is coming, if you are looking for the right words for your loved one, then check out these Valentines wishes and happy Valentines Day friend messages. The noodles looks so beautiful! Thank you for sharing the recipe!